We love, love love this walk. We’ve done it in the rain and mud; early in the morning; on dry and sunny days; when the tide is high and we can throw stones in the river, or when the tide is out and curlews and oyster catchers are calling. For me it marks stages of our lives: Eldest running and falling most of the way round; being carried in the tula or on shoulders; learning to climb stiles and now racing ahead leading the way. I have memories of Youngest in the sling and then the tula; sometimes sleeping all the way – none the wiser that we’d even been there; telling us all where to go, stop, wait; yet to walk all the way. It’s a great walk for kids as it’s so varied – there’s so much to see and the environment is ever changing. We’ve seen a wasps’s nest, mouse holes, speckled wood butterflies, a frog, wild garlic in the spring, blackberries and sloes in the autumn to name just a few. Parking: Free parking for 5 or so cars by the river at St Clement, some parking on the road in the village. Cafe: No. If you take the extra walk to Malpas there is a pub. Details below. Pushchair suitable? Nope. It gets muddy and there are steps and stiles. Time: Somewhere around 1.5 hrs including stops for exploring. Based on 5 year old pace. Steepness factor: 1 hill, the rest is mostly flat, some steps. This is a circular route. You can start either in Malpas or St Clement. We usually start from St Clement, and it’s our habit to pick up the path along the river first. I recently did it the other way round, following the road uphill away from the river (see picture). This means you tackle the up hill section first and the come to the more interesting parts of the walk later. It also means you tackle the biggest hill in a downwards direction! Helpful for little legs. But my favourite is still the river first. 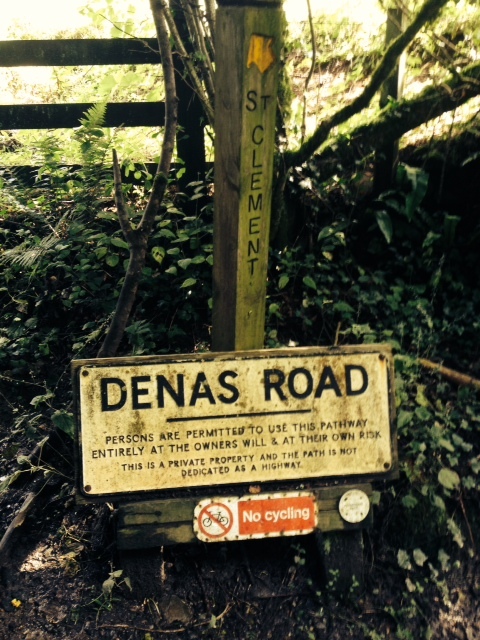 Park by the river in St Clements and pick up the Denas Road path from the car park. Follow the path under the trees ahead of you and keep the river on your left. This is often the muddiest part of the walk and can be wet even in summer (which is usually wet in Cornwall). The path takes you through the trees beside the river and there are views of the river most of the way round. The path turns to the right, following the river bank. Here there is a bench and a small pebbly beach. Follow the path over the stile which leads you into a field. Continue ahead with the river still on your left, up and over the ladder style stile, (watch out for the rather sharp chicken wire). Continue straight on through the next field and over the stile which takes you into the woods, and eventually into the pine woods. I love this part of the walk, it’s such a dramatic change, the light is different, you can smell the pine sap and feel the springy pine needle floor underfoot. You can still see the river on your left. Be careful, it’s fairly slippy on those pine needles and there are a lot of tree roots about. Keep heading straight on, past the HUGE tree that has cracked and fallen down from the path to the river below. Someone should hollow out a slide here. Getting back up again might be tricky through. I think this fell in the spring 2014 storms, we certainly saw it upright and majestic before it reached down to the river. Follow the path along and then sit and enjoy the view on the bench looking over the river the Malpas. The path takes a turn to the right and into the woods again. You can’t fail to notice the wild garlic here in the spring; it’s a carpet of white, and it you don’t recognise it by its flower, you will by the smell. There’s a stile along here but the path skirts it (although the kids always want to climb it). You can feel the freshness of the stream in the air. Go a little further along and it appears on your left. It is compulsory for us to stop and play pooh sticks on the little bridge. From the bridge, go through the kissing gate into a field. When we recently did this walk (18/08/2015) there was a sign warning of a bull in the field. We’ve not seen the sign before; nor did we see a bull. But we did walk at a brisk pace just in case. The path leads you up the steep hill to another kissing gate at the top with a large step for little ones to clamber up. Yes, it is steep, but the views when you get round the next few fields are worth it. Keep on through the field, follow the path as it turns left through another gate, then right and down the hill past Churchtown Farm. It’s uneven ground, but make sure you look up and see the view of the church and the river beyond. At the bottom of the hill, through the kissing gate and past the Farm house you will reach the road through St Clement. There are toilets to the left here (done up and cared for by the villagers.) Here you can take a short detour to take in the Church opposite you – an idyllic setting with it’s red phone box, old water pump and lychgate. Follow the road down the hill back to the river and the car park, past the garden that’s always full of flowers and the house adorned with tea pots and cups. It’s a shame the tea rooms have closed, but it makes this walk lighter on our pockets and waistlines. Enjoy your picnic or coffee on the bench overlooking the river. You made it!